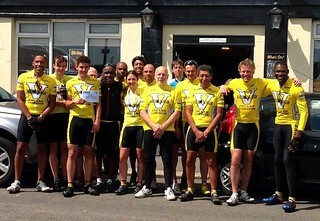 We are a friendly bunch of cyclists at all levels of ability, with 40-60 active members. We pride ourselves on being a very inclusive club. We are keen to welcome newcomers of all ages and abilities (though we require young people under the age of 16, to be accompanied by a parent or guardian). If you are thinking about joining us, you are very welcome to come along on a Saturday morning to try us out for 2-3 rides before you commit to being a paid up member. 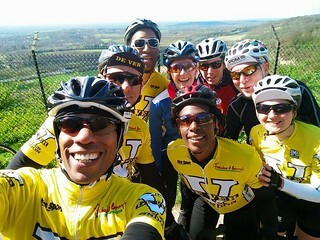 For further details of our rides see the How to Join and Club Rides pages. Some of our members regularly compete in local and national sportives and time-trials, while others come along simply for the ride with good company and the chance to maintain their fitness or to expand their fitness goals. We can support you at every level, whatever the reason why you have joined the club. We also have a few social events dotted throughout the year and an annual boot camp in April, at an all inclusive hotel in Lanzarote. This, we find gets your fitness rolling for the summer season ahead!